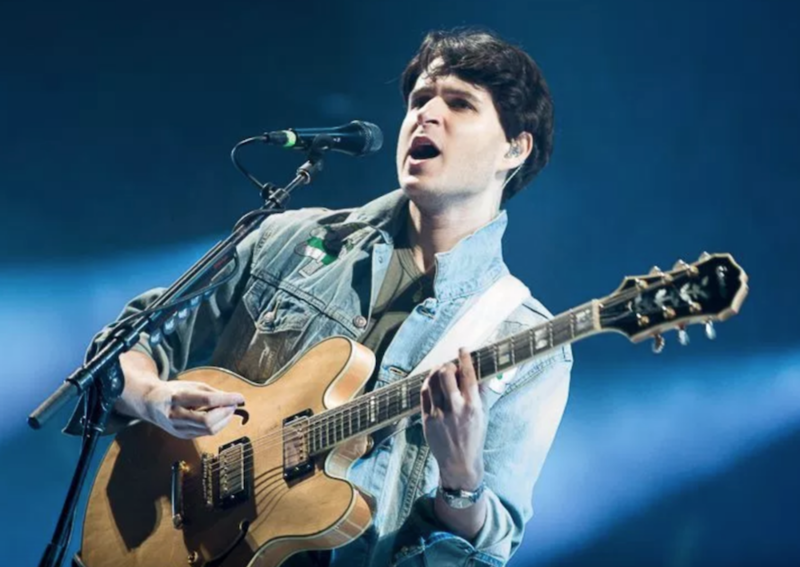 When Ezra Koenig announced the new Vampire Weekend album, Father of the Bride, he promised to release two tracks a month before the LP’s release date. While that means we’ve so far been gifted four tracks from the Modern Vampires of the City follow-up, we’ve yet to hear any of the material live. Today, the band changed that with their appearance on Steve Lamacq’s BBC Radio 6 show. With the full band in studio, VW delivered performances of three FOTB singles: “Harmony Hall”, “Sunflower”, and “2021”. (The other previously revealed track, “Big Blue”, was left out.) Koening described it is a “slightly stripped down” presentation, obviously to suit the setting. Even so, the radio renditions were more than enough to stoke anticipation for the band’s forthcoming tour (tickets for which, by the way, can be found here). In between playing the songs, Koening discussed the recording process with Lamacq. He talked about bringing in featured guests for the first time, the perceived long gap between records, and how exploring the band’s back catalog as seven-piece during last year’s festival appearances allowed them to “slowly get back into the bath.” Take a listen to the whole thing at the BBC, with the interview beginning at the 2:04:30 mark, and the performances coming in at 2:10:00 (“Harmony Hall”) and 2:23:15 (“Sunflower” and “2021”). Below, revisit former Vampire Weekend member Rostam’s appearance on Kyle Meredith with…, in which he discussed leaving the band and going solo. You can also stock up on Vampire Weekend’s vinyl releases here.